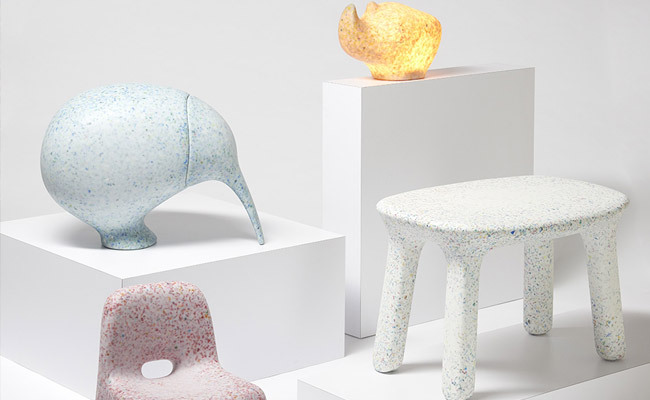 A collection of furniture made from old plastic toys your children don’t play with anymore. It sounds like an incredible idea right? A startup in Belgium is doing just that by creating a collection of colorful furniture aimed at children, all made from recycled toys. Studies show that the average use of a toy by a child is just over 6 months. Most of these toys end up on the ever-growing pile of plastic waste. By recycling this plastic, the company from Antwerp makes children aware of sustainability at a young age and helps them being creative. The collection exists of chairs, tables, lamps and storage containers. The storage container is shaped like the endangered Kiwi bird. The lamp is shaped like a rhinoceros, giving attention to the shrinking population situation of rhinoceroses around the world. "We found that plastic toys use plastic more intensively than other consumer goods," said Ecobirdy's founders, Antwerp-based designers Joris Vanbriel and Vanessa Yuan. "By giving old plastic a new life, our aim is to free our ecosystem from its pernicious impact. As we use innovative technologies, made for the reuse of plastic, there is no need to add any pigments or resin." Ecobirdy's debut collection follows an in-depth two-year study into how to sustainably recycle plastic toys. The design, recycling and production of Ecobirdy furniture is all carried out in Europe using fair business practices. An accompanying limited-edition storybook plus a school program have been designed to introduce children to the circular economy – which aims to minimize resource usage and waste by using sustainable materials to create long-lasting products that can be recycled – and inspire them to contribute to a more sustainable future.